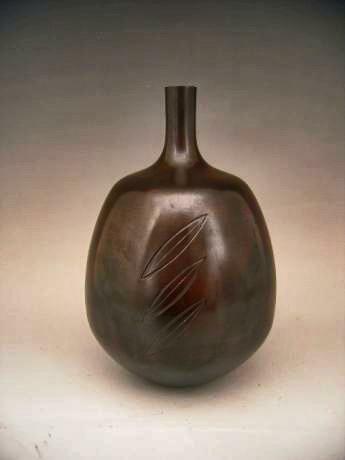 Japanese 20th Century cylindrical vase by Japanese Living National Treasure, KANAMORI EIICHI (1908-2001). 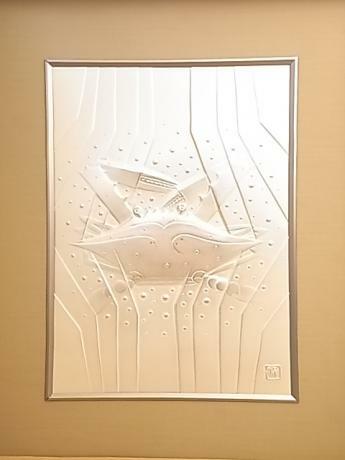 The vase has a simple yet elegant design of a single tulip outlined in inlaid silver. The inside of the tulip is done in a rusty red color. 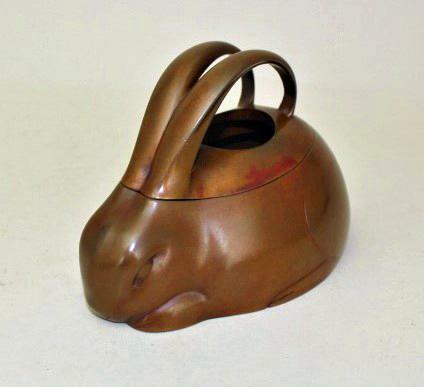 The vase stands 9 7/8" tall by 3 5/16" wide at the ..
Japanese early 20th century bronze incense burner, or KORO, in the art deco stylized shape of a rabbit. Made by bronze artist YAMAMOTO KOZAN (1892 - ?) Signed KOZAN on bottom. The KORO comes with TOMOBAKO, or original artist signed wooden storage box. 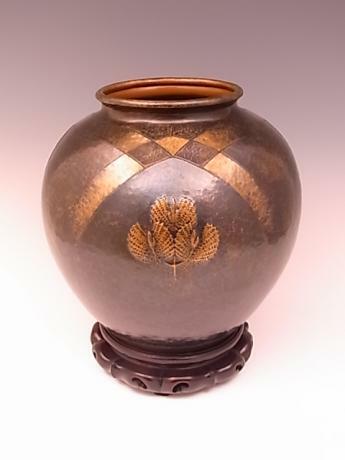 The KORO measures 4 7/8" long, 3 1/4" tall..
Japanese mid 20th century hand hammered copper vase with leaf design by GYOKUSENDO. 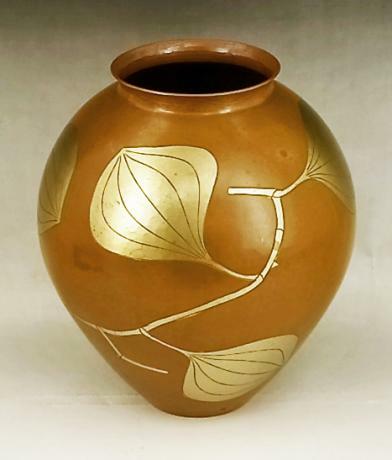 The copper colored mat finish vase has leaves and branches done in gold color. The vase measures 7 1/2" tall and 6" in diameter. The vase comes with TOMOBAKO, or original artist signed wooden storage box. 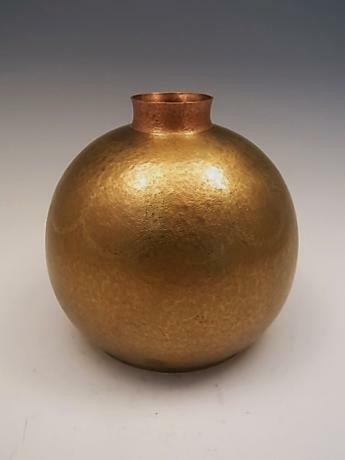 (none..
Japanese 20th century bronze vase by artist, SATO SHUKUTAKA. SATO SHUKUTAKA was born in 1943 in Tokyo. The hand-hammered vase has a circular scalloped design draping down the side of the vase. 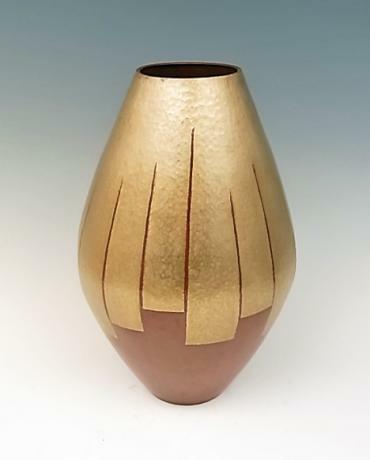 The vase is copper with gold finish and inlay. The vase is stamped SHUKU on the bottom. 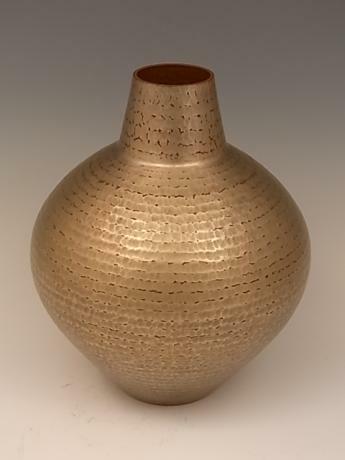 The vase com..
Japanese mid 20th century hand hammered copper vase by GYOKUSENDO. The vase has a wonderful design of golden panels coming down from the top of the vase. 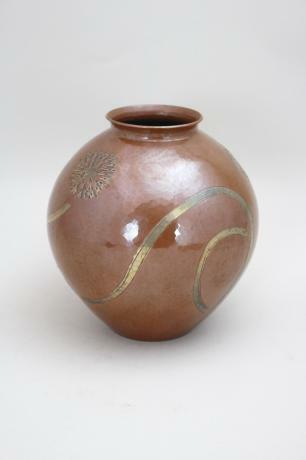 The vase is signed by the artist, KAKUHEI V (1901-1992)and also has the GYOKUSENDO stamp on the bottom. 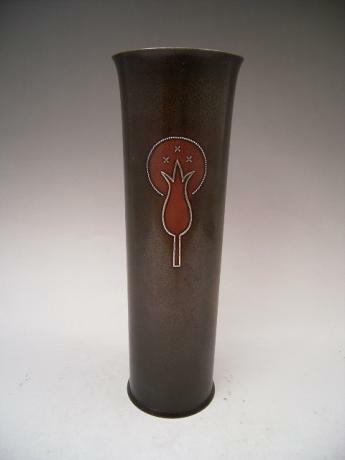 The vase comes with TOMOBAKO, or orig..